But sometimes I run out of special items, and that’s when I turn to the old stand-by, oatmeal. I’ve been making it on the stove-top for years, because that’s the only way I knew how to make it (other than in the microwave using DIY instant oatmeal packets). But now that I’ve been properly introduced to Instant Pot oatmeal, I must say, I don’t really want to make it any other way! Don’t get me wrong – stove-top oatmeal isn’t hard. You measure the oats and water, add butter or salt if you want (which we ALWAYS want), turn it up and let it cook. But for some reason, mornings have felt busier lately and I simply don’t have a few spare minutes to stand at the stove. So for me, being able to dump the ingredients into the Instant Pot, turn it on and walk away is a huge time-saver. I’ve joked with my friends that the Instant Pot is like a second set of hands in the kitchen. I love making Instant Pot brown rice while I’m working on the meat, or making Instant Pot whole chicken while working on the side dishes. With Instant Pot oatmeal, breakfast is 100% hands off and I can go do something else! 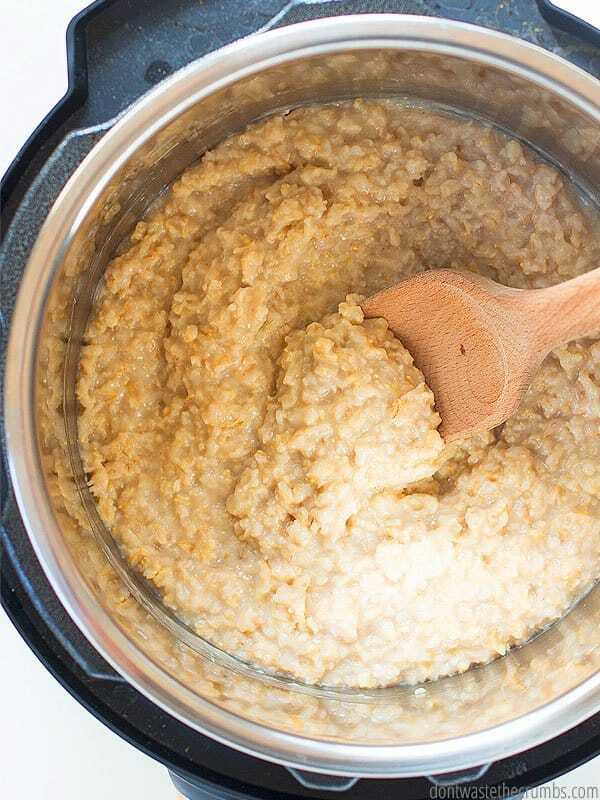 Most Instant Pot oatmeal recipes call for using steel-cut oatmeal. I haven’t tried using steel-cut oats because my perfect steel-cut oatmeal recipe is just that – perfect. I don’t want to mess up a good thing! Plus my kids aren’t huge fans of steel-cut oats anyway. We’ve done side-by-side taste tests and they simply prefer rolled oats instead. So that’s what I used for my Instant Pot oatmeal recipe. Using an Instant Pot isn’t difficult, but there are a few learning curves if you’re brand new. One of those lessons I learned the hard way and I ended up burning breakfast the first time I made it. With that said, follow the directions I have below and you’ll be fine! My Instant Pot oatmeal recipe is pretty basic because every family likes their oatmeal differently. Heck, ask my family how they like their oatmeal and you’ll get four different answers! But that’s the beauty of the recipe – it’s entirely customizable. Add raw fruit and spices with the oatmeal and they’ll cook at the same time… just like stove-top oatmeal. Or you can make it plain as written and add your toppings separately – it’s completely up to you. My kids don’t care if their oatmeal was cooked yesterday, so I can make a really big batch at the beginning of the week and have enough to cover breakfast for several days. When you make oatmeal on the stove, you have to adjust the cooking time depending on how much you make. 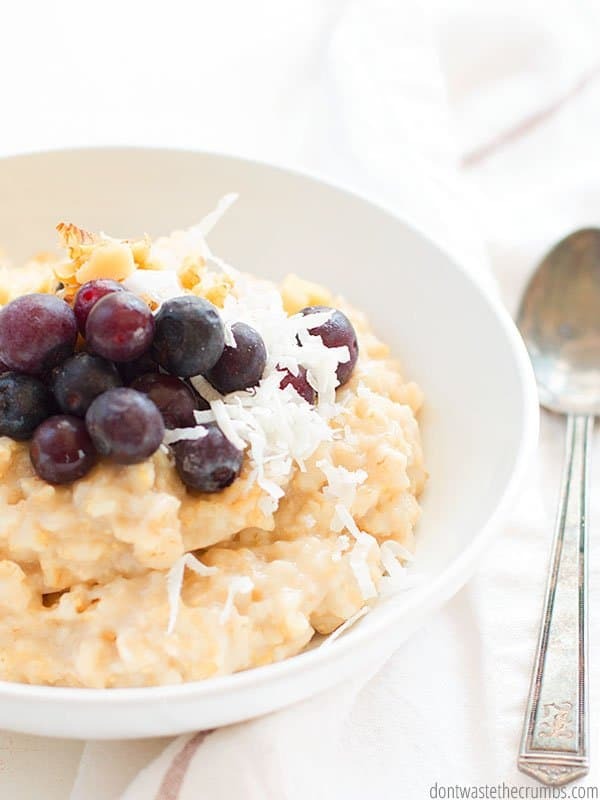 With Instant Pot oatmeal, you can make as much as you want and the cook time doesn’t change. That’s one of the reasons why I love the Instant Pot! 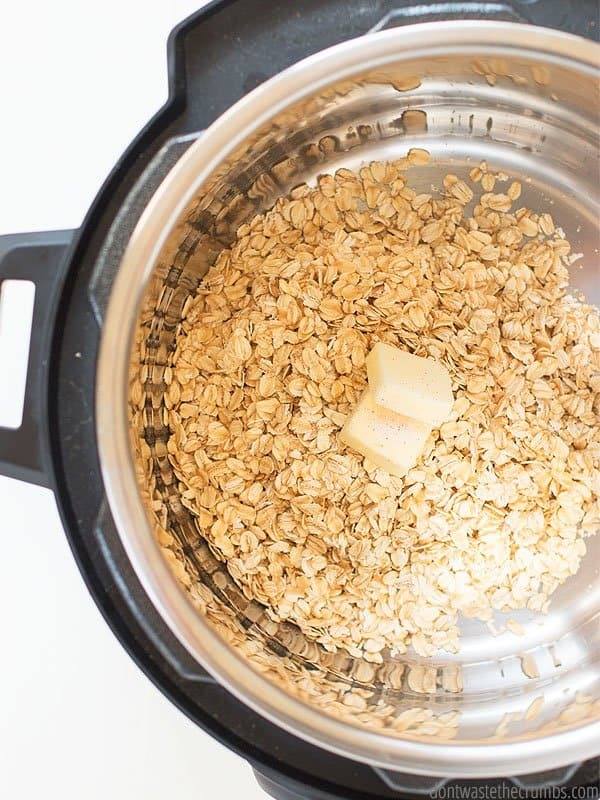 I have the 8-quart DUO Instant Pot, so I can REALLY make a lot of oatmeal, but you should be able to at least double this recipe in a smaller Instant Pot. Just make sure you don’t go above the max fill line! We prefer to reheat it on the stove and adding milk to make it creamy again. Psst – if your family doesn’t like leftover oatmeal, consider making extras anyway. Leftover oatmeal chocolate cake is always a hit in our house, as is maple oatmeal bread! Sometimes I intentionally make extra oatmeal so I can make Crispy Oatmeal Cakes! Have you ever turned on the stove and walked away with the intention of coming right back… only to completely forget you were cooking something and come back to an empty pot? Or oatmeal splattered all over the stove and counters? I’ve done this more times than I can count, but the Instant Pot saves me from all this mess. Not only does it beep at me to tell me when it’s done, but it doesn’t splatter either. And if it did by chance, it’ll be confined to inside the pot! Per ounce, oatmeal is one of the most affordable whole grains you can buy. That’s why we use it often in recipes like cinnamon oatmeal blender waffles and oatmeal chocolate chip cookies and no-bake peanut butter chocolate chip granola bars. My buy-price for rolled oats is 50¢ per pound and I usually buy this package from Costco (although Costco’s price is better than Amazon’s). Kids love it, it’s cheap, and packed with nutrients. Win-win-win! I chose blueberries, coconut and chopped walnuts for this batch of oatmeal, but you can choose whatever you want. 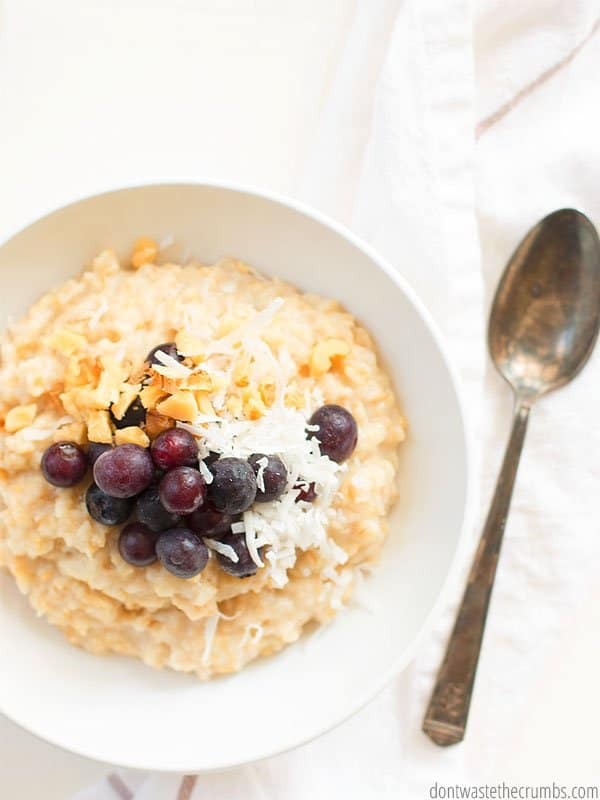 Eating seasonally will keep the costs down, and while oatmeal is already a stick-to-your-bones type of breakfast, adding a healthy dose of fat will keep bellies satiated until lunch. There are also ideas in my marathon training high protein oatmeal, if you’re looking to boost the protein of your oatmeal too! Combine ingredients in the Instant Pot. Close the lid and make sure the sealing valve is turned to the sealing position. Press the "manual" button and make sure the Instant Pot is on medium pressure. Adjust the time to 4 minutes. When the oatmeal is finished, use the Quick Pressure Release method by carefully turning the sealing valve from the sealing position to the venting position. Make sure your face and hands are not over the valve when you do this. When the pressure has released, serve and top as desired! How do you use leftover oatmeal? Share with me your ideas and your favorite recipes in the comments below! My Instant Pot is rather Newer Model, and they don’t have “Manual “ setting. How can I adjust the pressure level to Medium? Just press pressure cook them turn knob till it says med. you could use saute on yer UP if you keep it out…. to heat up your day old oatmeal and add milk to it. I love how the instant pot has that saute button. oatmeal is even better the next day. There isn’t a medium setting on any Instant Pot. High or Low only. And medium is not different on different models either. It might be beneficial to post pics of your units settings on your recipes so that we can duplicate your device settings. I’m trying my first pot of oatmeal. I have an Instant Pot brand but i can’t get it to medium pressure using manual. So I’m doing low rather than high for 4 min and will see what happens. I added golden raisins and dried cranberries. I usually cook my oats in milk but used water for the first time. Do any adjustments need to be made for using milk? Thanks! No adjustments made for milk other than lower pressure (high can build pressure too fast resulting in scalding the milk and the burn error). Good call on the pressure! To note, you can mix milk and water and use high pressure, but all milk might yield the error. I use 1 oats to 3 milk, pot in pot, 4 min. Remember to pour water in the IP liner too. I have a LUX. So my way IS ’high’way :-). 2 of milk works too but it becomes hard. 3 of milk stays soft even after cooling. I prefer to use Pot in Pot method for making oatmeal, because it comes out creamier. Maybe it’s because I have an 8 quart, but my oatmeal dries out on the bottom and I have to scrape it outta there if I cook it directly in the IP liner. But man, it makes mornings faster when you don’t have to babysit the stove!!! Mine sticks a little (I have the 8 quart too), but cooking on medium or low made the biggest difference. Cooking on high was no bueno. Totally agree on not babysitting the stove! I haven’t had any issues with 4 cups of water, but try 5 cups next time! Mine said burn when I added apples but not when I added dry fruits. Maybe that is the difference. I have an 8 qt. IP. I cooked it on low too. But it did finish the last 2 minutes after it said burn for about 2 minutes. I debated stopping it instead of fi ishing the 2 minutes but it still turned out perfect! This worked great for me on low pressure, no butter. Thanks so much! I tried this this morning, and learned something new. The Instant Pot can spell burn. I made it with water, on high pressure, at the other setting on ‘normal’ the middle choice. What did I do wrong? I put leftover oatmeal in a small loaf pan and chill. Slice and brown in butter. Serve with syrup-my kids called these oatmeal cakes. Interesting!! I’ve never heard of this before. I’ll have to give it a try – thank you for sharing Elaine! Way easy idea . Thank you. I wouldn’t recommend it Julie. Milk and milk products tends to burn in the Instant Pot. Thank you for the great recipe. I’m new to Instant pot cooking. No Med. on my 6 qt pot. So I did High (debating if I should do low) but I thought I’d try. lowered the time to 3 mins and it turned out Fantastic!! I’m going to try it on low for the heck of it next time though just to see. Why isn’t milk a good idea? I love the way milk gives it a creamier taste? Can you add cinnamon and brown sugar to the recipe or should season it later? Milk doesn’t do well in the IP. 🙁 If you add cinnamon and sugar, add it afterwards so you don’t risk burning the sugar on the bottom of the pot. That’s why milk is not recommended – it burns fast. I have an InstaPot with only low and high pressure settings. I just made a batch altering the ingredients to 1.5 cups milk and 3.5 cups water. Low pressure. 4 min. I also added chia seed & cinnamon. Quick release until pressure is gone and stir immediately. Added honey and it was stellar! Ooh – chia, cinnamon and honey sounds DELICIOUS!! Your Recipe sounds ideal . I have an 8 qt. Ultra ! Thank you for this recipe! Oatmeal is definitely a staple in my house too. I have the 8 quart pot, so I don’t have a manual setting. I made a few adjustments. I tried it with using 2 cups water and 3 cups milk, and cooked on low pressure for 4 min. It came wonderfully creamy and soft! It did burn a little on the bottom, but not too bad. I’d definitely use his again! And thank you for the topping tip for maple syrup and vanilla! It was divine, and made breakfast extra special! I made this in my LUX mini the other day and when I did the QR it splattered all over the place! The oatmeal came out great, but I’d rather not have the mess. Would it be okay to do natural release instead of the Quick Release? I’d do a natural release for a few minutes, then QR. Too long on natural release will keep cooking the oats… which may or may not be a big deal to you, but just a heads up! I use small mason jars. They m.j ake a perfect single serving and will beautifully. I layer my oats, almond milk, greek yogurt, chia seeds, blueberries, and a chopped nut topping. I cook it using the rice setting for sreel cut oats, our fav. My husband wirks crazy and long hours and he loves how they get him through the day. P.s. thank you for the advice on the rolled oats. I prefer steel cut but needed some mushier oates after oral surgery. WOW, Sorry about all the typos! Hope its its understandable! Do you change the time if you double the recipe? Nope – cook time is still the same! Hello! I’m looking forward to making oatmeal with your recipe tomorrow morning. I’d like to use cashew milk. How much do you think I should use? Thank you in advance. Hi Debra! You need the same amount of liquid regardless of what liquid you use, but I don’t recommend using all milk for the recipe as the milk will scald in the IP. I’m a newbie. Just bought my Instant Pot at Costco last week. My oatmeal turned out delightfully creamy! I cooked on low pressure (mine doesn’t have a medium option.) And I didn’t cook with fruit – just oats, butter, water, and a bit of salt. Thanks! I am an IP newbie, I just received one a few days ago for my birthday. Thank you for the step by step easy to follow directions. It is a little intimidating trying to figure out when to release pressure the first few times you use the IP. My IP is a 6 quart Nova that doesn’t have medium setting. I used pressure cook on low and did not adjust the time. I also made it plain so everyone can customize with their own toppings. It turned out perfect! We will definitely be having this again. That’s wonderful Deidra! The best piece of advice I can give regarding the pressure release, is that if you use natural pressure release (NPR), the food keeps cooking… so if you’re making something that you don’t want over-done, like meats or steamed veggies or pasta or rice, go for quick pressure release. If you don’t care if it keeps cooking, like for soup or stews or beans you’re going to mash up anyway (i.e. refried beans), then NPR is fine! I tried this and when I released the pressure the “oatmeal juice” came flying out of the pressure dohicky. It was a mess to clean up and took longer than the cooking part. Oatmeal was good, with leftovers, but I don’t know what I did to make such a mess. Thank you for your thoughts. I’m skittish now and not sure if I will try again. What a mess! We are planning on making a big batch of oatmeal for a gropu of people. I know not to go anove the fill line. Ehtvis the largwst amount you have made and whatvwere the water/ oatmeal amounts. Thank you. 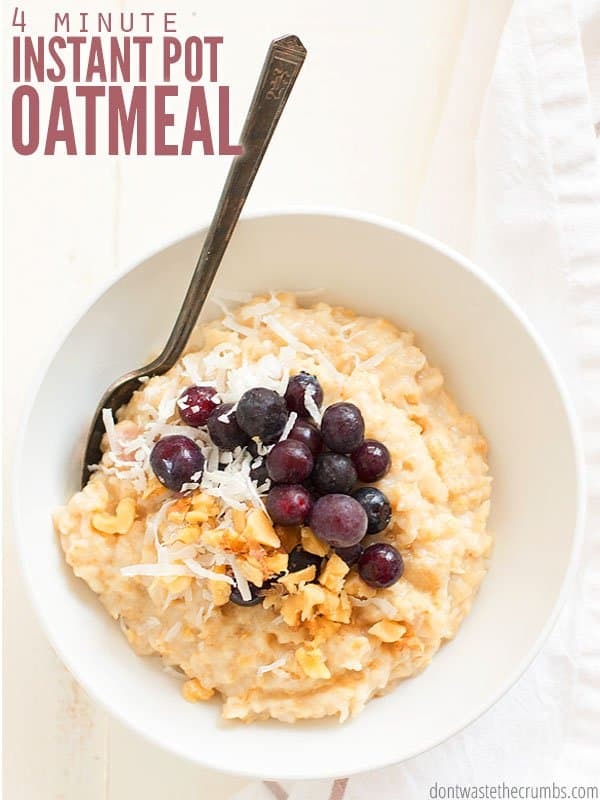 The largest amount of oatmeal I’ve made is for this recipe, but remember that oatmeal will foam up as you cook it, so you shouldn’t fill completely to the fill line. In the case of oatmeal, it’s the halfway line of the pot. With that said, I haven’t made that much oatmeal personally! I followed the recipe exactly, omitting both the butter and salt. It came to pressure, cooked for 4 minutes and I used the quick release, as instructed. I got hot liquid spewing from the vent. I shut the IP off and it came down to natural re,ease on its own. The oatmeal was very soupy but after a few minutes the liquid absorbed and the oatmeal was delish. I use left over oatmeal in my pancakes. It tastes great if your pancakes are made from scratch or you use a mix. Mine turned out great! 5qt IP, manual low pressure setting @ 5 minutes. I have the standard 6-qt Instant Pot, and this recipe worked beautifully. I substituted a cup of oat milk for one of the cups of water (4 cups water, 1 oat milk) and added a chopped apple and 1/2 mashed banana, along with a sprinkle of cinnamon. It came out great – perfect for a cold winter morning. When you first open the IP, it seems watery, but it only takes a few stirs to thicken up. Will definitely make this recipe again – thanks! You’re very welcome Sonya! Your additions sound DELICIOUS! Yum! This turned out really good. I used 3 cups of water and the remaining 2 cups of Almond Breeze’s almond/coconut milk which gave it a lovely flavor. I was also careful to use the low setting since others reported burning. I’m so glad you liked this Xina! Can you suggest an oat (rolled Old Fashion) to liquid ratio? It seems that on the package if you double the oats you don’t double the liquid…. Have you tried a batch this size? I am thinking low pressure for 4 min?